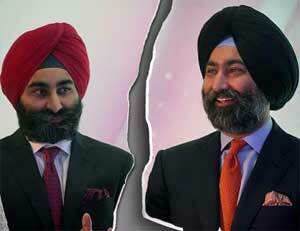 New Delhi: The family feud between Billionaire brothers and founders of Fortis Healthcare turned ugly on Friday, after elder brother Malvinder Mohan Singh accused the younger brother Shivinder Mohan Singh of physical assault. “Today, December 5, 2018, a little after 6pm, Shivinder Mohan Singh assaulted me at 55 Hanuman Road. He physically hit me… injured me, broke a button, gave me a bruise, and kept threatening me and refused to budge until the team here separated him from me,” he said. TOI reports that according to Malvinder, the episode took place after Shivinder tried to disrupt the board meeting of a group company, Prius Real Estate, which, as he claimed, lent around Rs 2,000 crore to Gurinder Singh Dhillon’s firms. “Approximately ₹3,000 crore have become due for payment from Prius to the RHC Group. Then, the Dhillon family owes Prius Real Estate some ₹2,000 crore, which has become due. The meeting was held to recover the money from the Dhillon family which would have flown to RHC and eventually Daiichi Sankyo and other lenders,” Malvinder Singh claimed in the video. He accused that Shivinder tried to disrupt the meeting despite not being a shareholder or an employee of the group and assaulted him when he reached to intervene. Meanwhile, denying all the claims, younger brother Shivinder, made counter-accusations stating that it was Malvinder who assaulted him. He further added he went to file a police complaint against his brother, but was stopped by his family members including his mother. Medical Dialogues team had earlier reported that in the month of September, Former Fortis Healthcare promoter Shivinder Mohan Singh alleged that his elder brother Malvinder forged his wife’s signature, perpetrated illegal financial transactions and led the company into an unsustainable debt trap. In a petition filed before the New Delhi-bench of the National Company Law Tribunal (NCLT), the younger of the Singh siblings, who were synonymous with each other for decades, sued Malvinder for “oppression and mismanagement” of their companies. Sat sang teaches people to live in peace. Why this violence among brothers? I thought Radhasoami Beas should have trimmed so aggression out of them. May Wahe Guru lend both the brothers enough wisdom not to make their fight public. Both of them must care for the family honour earned for the last many decades.